Square Enix recently relaunched «Final Fantasy XIV», in an effort to grab a bigger piece of the lucrative MMORPG pie. This marks their third throw of the gauntlet into this arena, but despite being the preeminent maker of traditional RPGs, their online offerings have so far been met with only moderate enthusiasm by fans of the genre. Their first attempts were orchestrated by Squaresoft veteran Hiromichi Tanaka, perhaps best known as the producer of classics like «Secret of Mana» and «Chrono Cross». After playing «EverQuest» in the late 90s, he was inspired to make a «Final Fantasy» which focused primarily on player interactions. This resulted in «Final Fantasy XI Online», which was released in Japan on May 16, 2002. It was brought across the pond to the US the following year, and to Europe the year after that. It was however quickly eclipsed by «World of Warcraft». The main reason for this was likely that «Final Fantasy XI» was very much an "old-school" MMORPG, where teamwork was mandatory in order to advance. It was also a little bit too reminiscent of «EverQuest» for its own good. But It was not without merit, and has so far been the biggest financial success in the Square Enix portfolio, due to its dedicated and sufficiently large player base providing steady income from subscription fees. However, it never quite reached the astronomical heights as the more popular and player friendly «World of Warcraft». 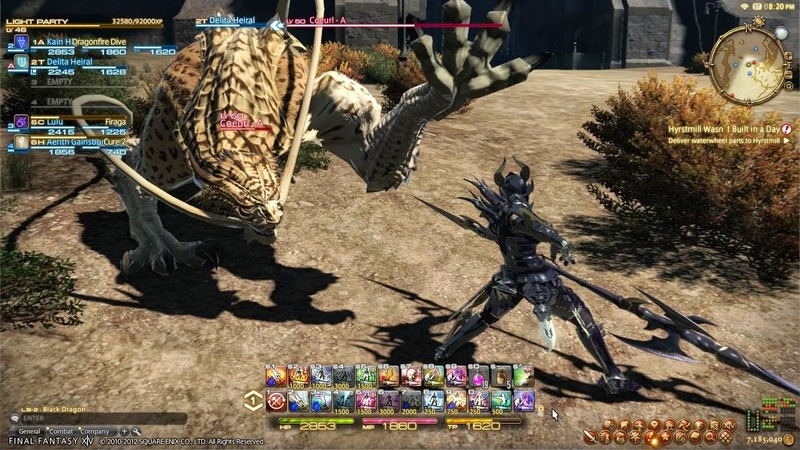 «Final Fantasy XIV» was meant to change that, and was originally released on september 22, 2010 in order to beat «World of Warcraft: Cataclysm» to market. This was likely too soon, as the release was an incoherent and unfinished mess, almost universally reviled by critics and fans alike. Due to its less than stellar reception, the reigns of the project was yanked from Tanaka's hands and given to the somewhat younger Naoki Yoshida before the year was over. Yoshida and his team have since been working hard to turn the game into something worthy of the «Final Fantasy» name, and have practically rebuilt the game from scratch. 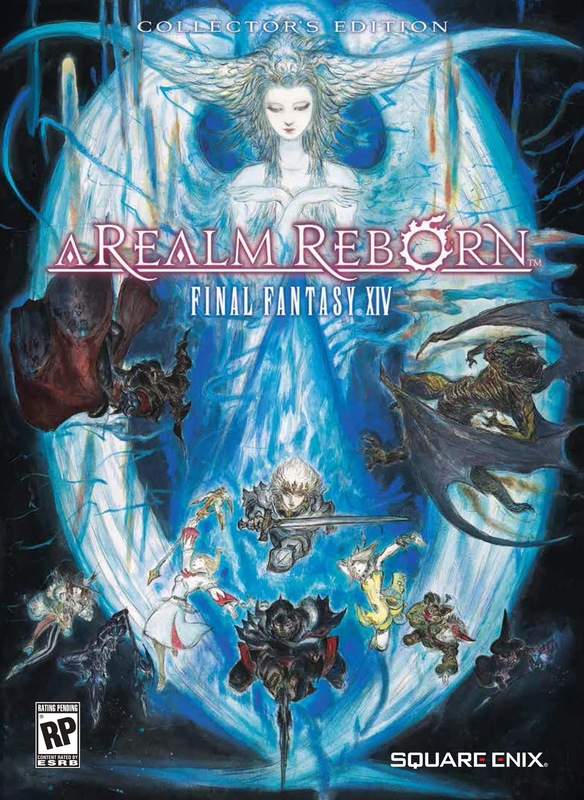 The result is «Final Fantasy XIV: A Realm Reborn». Despite the wanton destruction, post cataclysm Eorzea has finally become a place worthy of exploration. Unlike the first iteration of the game, where landscapes outside major cities were more or less cut-and-paste jobs, the zones in «Final Fantasy XIV: A Realm Reborn» are well designed, varied, and have lots of details. It also has great weather effects. The sky changes color gradually as the day passes into night, light shimmers through leafy treetops, and if you happen to pass a waterfall when the light shines from a certain angle, you might see a little rainbow where sunlight intersects with moisture in the air. The local wildlife also adds to the mood by doing little things like sniffing for food if left alone. This makes them appear more lifelike, and one gets the feeling that they live in the area, as opposed to just being experience-points-grinding-fodder for players. «Final Fantasy XIV: A Realm Reborn» appeals to my inner explorer in ways a computer game hasn't done since I was hooked on «The Elder Scrolls V: Skyrim». The game's main plot primarily revolves around an alliance between the forest nation of Gridania, the seafaring city state of Limsa Lominsa and the Ul'dah sultanate, maneuvering to hold the megalomaniac Garlean empire at arms length. The Garlean empire has many similarities with the empire from «Final Fantasy VI», including its reliance on "Magitek", a technology which combines the magical and the mechanical into things like airships, gunblades and powered armor. The empire's vanguard is lead by Legatus Gaius Van Baelsar, the Garlean equivalent of Darth Vader, and his henchmen who all dress and behave like judges from «Final Fantasy XII». In other words, the plot builds upon the original game instead of being a complete reboot. 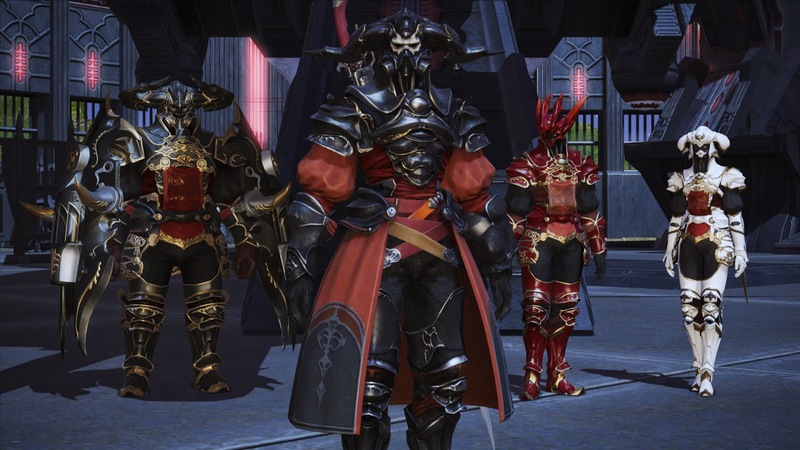 What is new in «Final Fantasy XIV: A Realm Reborn» however, is that the game has become much more player friendly. Both of the earlier online attempts had interesting game mechanics, but you often had to dig through heaps of bad user interface and intermittently cruel approaches to balancing in order to get to the good stuff. In this latest incarnation however, it finally looks like things are starting to come together. Like in «Final Fantasy XI», you are not tied down to the job you select when you first create your character. Instead you can change your profession anytime through the game's "Armory System". This is done quite simply by changing your gear, and can be done for crafting jobs as well as the traditional battle oriented professions. For instance, by equipping a spear you become a "Lancer", whereas if you pull out a skillet you become a "Culinarian". Keeping track of different gear configurations is easy, as these can be organized into sets, and there is plenty of space in your inventory from the get-go. As such it's only strictly necessary to have one character, even if you want to experiment with alternative ways of playing the game. As you level the different classes, it's possible to combine abilities from one class with another, just like in «Final Fantasy V». You can also unlock new jobs as you advance. For instance: By taking the fighter class "Gladiator" and the support class "Conjurer" to certain levels, you get the option to unlock "Paladin" which in addition to being able to use abilities from the two basic classes, also has its own unique skill set. Leveling up is also much improved from previous iterations. You accumulate experience points from pretty much anything you do, being it quests, crafting or exploring new areas. The classical approach of murdering innocent wildlife is also an option, but it's nowhere nearly as vital to progression as in more traditional RPGs. It's in fact quite possible to take a character to the level cap, almost exclusively by doing the quests related to the main story. The battle system has excellent pacing. It's fast enough to not be boring, but not so fast that you don't have time think about tactics. Automatic attacks are your basic bread and butter, but each class has a number of special actions which provide options for defense or optimizing kill-speed. Some attacks can also be stringed together to create combos, and this adds a welcome layer of depth to the proceedings. The game supports a functional and configurable mouse and keyboard setup, but also has an option for playing with a gamepad. Both alternatives have their merits. The mouse and keyboard combo is superior for navigating menus, but I actually preferred the gamepad setup. Primarily because the game requires a fair bit of tactical movement, and this is more comfortable with analog sticks. For instance, many attacks do more damage if delivered from the flank or back, and some enemy area-of-effect attacks are telegraphed and can be avoided with quick repositioning. Battles with mobs around your own level are usually over in seconds, as opposed to minutes which used to be the norm in its slower predecessors. It's also no longer necessary to be the first to claim a monster to reap rewards from killing it. Anyone can join battles anytime, and will be given experience in accordance with their contribution. This greatly reduces territorial disputes between players hunting the same prey. The game also incorporates massive public brawls, like the dynamic events from games like «Guild Wars 2» and «Rift». These so called "Full Active Time Event" or FATE encounters, are happenings that periodically pop up around the world. They usually consist of free-for-all, large scale monster attacks. These events are also an excellent source of experience points. If you want a more organized co-op experience, there are options. One of the more practical ones is the "Duty Finder". This is a mechanism for automatically matching up players for missions and dungeons based on class roles. As others enroll, a team is constructed from the pool of available players, some of which may even be on other servers than your own. When the setup is done, everyone is teleported automagically to the mission, and back again when it's over. Simple and user friendly. «Final Fantasy XIV: A Realm Reborn» is a vast improvement over earlier Square Enix online titles. But if there is something I occasionally miss from the old days, it would have to be the bonds of friendship which were often forged during the manually constructed old-school experience point parties, when you kind of knew the odds were stacked against you, but still managed to pull through due to good cooperation. Because everything is more streamlined and automated in «Final Fantasy XIV: A Realm Reborn», the need for high levels of cooperation is drastically reduced and as such, despite having done countless missions and dungeons with others, I haven't really noticed most of my fellow players yet, neither in a positive or negative fashion. They are just there now. What I however don't miss, is the waiting and general frustration associated with trying to manually put together a party from a pool of people who may or may not even stay until completion. So all in all, I guess I prefer the new streamlined approach. Bonds of friendship are better cultivated in real life anyway. The game also coughs a bit when there are too many players on screen at the same time. A drop in its otherwise smooth frame-rate is to be expected under such circumstances, but in «Final Fantasy XIV: A Realm Reborn» even the sound skips a few beats, which is quite unusual and annoying. It fortunately only happens in the most heavily populated areas, and can be mitigated by turning down graphical detail. Also, many of the awesome tunes by Nobuo Uematsu from the first iteration of the game are gone. They have been replaced by tracks composed by new sound director Masayoshi Soken. Fortunately the quality of the new material is great, tunes are longer and more numerous and generally fully up to par with what one might expect from a «Final Fantasy» game. There is also an option to choose between English or Japanese voice acting, which is always a plus in my book. All in all, I have to say that Yoshida and his team have really come through with pulling «Final Fantasy XIV» back from the brink of irrelevancy. Much because of all the user friendly redesigns of things which earlier just weren't working very well, but primarily because the game finally feels like a «Final Fantasy» game as opposed to just another generic MMORPG. Whether it's capable of retaining subscribers on a monthly basis remains to be seen. This will depend largely on the frequency and quality of future content, but perhaps mostly on whether people are still willing to support a subscription based payment model in the current age of "free-to-play" alternatives.